Q: I’ve been in several conversations regarding this question with pilots from all levels of experience and knowledge, but am yet to receive an answer I find to be satisfactory. In my personal experience I have soared (exclusively ridge lift) sand dunes as small as 5 vertical ft and mtns reaching thousands of vertical ft. I’ve observed that it takes a MINIMUM of 15mph to stay aloft on the small sand hills, whereas I’ve ridge soared larger mtns in 8mph wind. Although, this probably doesn’t sound surprising, what accounts for the difference? Put simply, why does it take more wind to soar smaller hills? We can apply this principle when looking at ridge lift. We need the vertical component of the airflow to be 200 fpm or better in order to soar. The vertical component is an important clarification. 200 fpm is less than 2.5 mph… and obviously we need more than 2.5 mph of wind to ridge soar even a vertical cliff face. The reason is that air is a gas, and gasses can be compressed. Wind is really air moving from some area of higher pressure to some area of lower pressure, and we feel “wind” as that air moves past us. This can be air moving large distances, such as cold air from Canada blowing down into the US, or it can occur on a macro level in the form of a “gust” before or after a thermal passes by. Same cause- differences in pressure. And the air movement is lateral… from higher pressure at point A, to lower pressure at point B. Terrain just gets in the way of this lateral airflow… and if that terrain faces the right direction and has the right shape, the air passes over the terrain creating ridge lift. But above this lift is still horizontal airflow, and that causes compression of the airflow and “squashes” the vertical component of the airflow. Simply put, a little hill creates a little vertical component, but it’s easier for the air to just bend around the little hill so less air is forced upward. A big mountain, on the other hand, creates a much bigger change in airflow… and that airflow will have a greater vertical component (even if the sand dune and the mountain are the exact same slope). The second reason is related to the first, but has to do with Newton’s laws of motion: One being that an object in motion will remain in motion until acted on by another force. In this case our “object in motion” is the air (ridge lift) and the other force is the descending hang glider (creating lift and “pushing” air downward). In my earlier example I said a hang glider descending at 200 fpm, but flying in air that is rising at 200 fpm, will remain at the same elevation… and while this is true, in order to get air rising at 200 fpm past the glider it actually needed to be rising faster than that before it encountered the glider, because the descending glider exerts a force on the rising air and slows it down. I think this is the bigger reason for the phenomena you mentioned, where small dunes need more wind than big mountains. The vertical “lifting” component of that wind is clearly one aspect, but a small cliff is still a cliff, and a big sloped mountain is still sloped. What is different is the VOLUME of rising air. 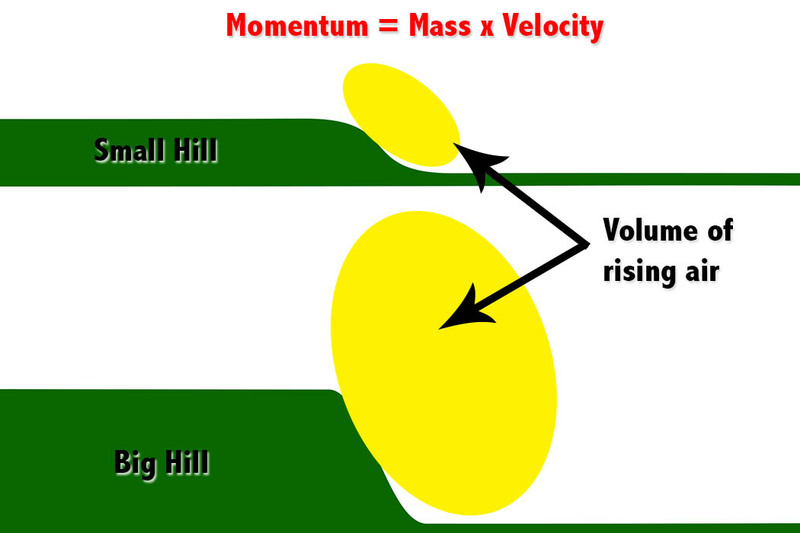 The force the descending glider exerts on the air it flies through remains constant in either scenario, but since momentum is the product of mass and velocity (momentum = mass x velocity), a larger volume of rising air will have more mass. Yes, air has mass! The tricky thing to wrap our minds around is that the larger volume of air, with it’s more momentum at a given speed, exerts a greater force on our wing even though it contains the same exact vertical component of rising air. Real life example is that getting hit by a ping pong ball going 10 mph doesn’t hurt all that much, but getting hit by a car going the same speed might leave a mark. Air density can also be a factor, where denser air (lower altitude, colder temp, less humidity) will have more mass than the same volume of less dense air… which I suspect is why we can ridge soar in lighter velocity winds in the winter (the colder, drier air has more mass and can have the needed momentum with less velocity). In your question you said that you have yet to receive an answer you find satisfactory… I’d welcome your input here as well! I am not above learning too, ya know? Thanks to Raffael Housler for that! I am admittedly not a physics major, and clearly there is a LOT going on when it comes to wind hitting a hill! Learning is fun!